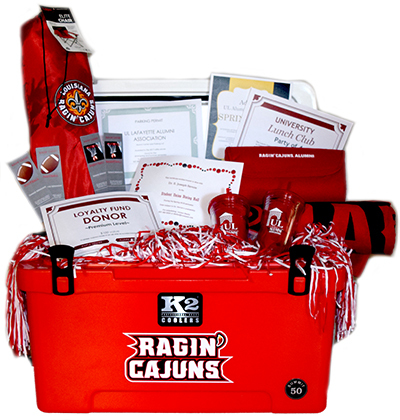 Purchase your tickets today for a chance to win over $1,500 worth of Ragin' Cajuns merchandise! Tickets are available online, at the Alumni Association's tailgate for home football games, and the Ragin' Cajuns Store locations. The drawing will be held Saturday, Nov. 25, 2017 at the Alumni Hospitality Tailgating Tent one hour prior to kickoff. Winner does not need to be present. Tickets are $20 a chance or $100 for 6. Thank you to our lead sponsors: Lowry's Printing & Signs, K2 Coolers, and The Ragin' Cajuns Store.